PM's Fitness Video - 'Please Spare Me'! Rahul Gandhi mocked the fitness video of PM Narendra Modi by describing it as 'bizarre' and 'ridiculous'. 'Have you see the PM's fitness video? It is ridiculous..It is bizarre...this is bankruptcy,' he commented at the Iftar Party hosted by him. 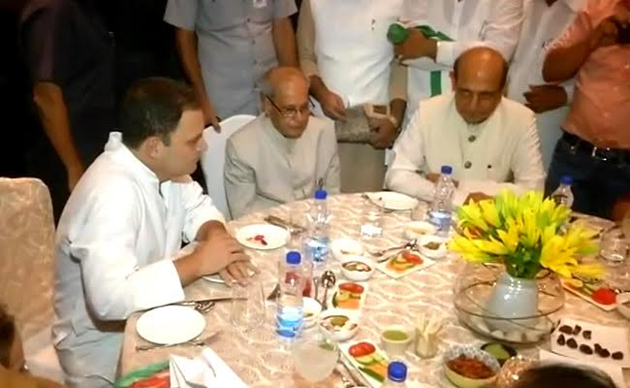 Former Presidents Pranab Mukherjee and Pratibha Patil were also sharing the table when Congress Chief made this comment. Rahul even asked Sitaram Yechury if he made a fitness video to challenge Modi. The CPI (M) General Secretary who burst out laughing replied: 'Please Spare Me'. Even DMK leader Kanimozhi, Trinamool Congress leader Dinesh Trivedi and BSP leader Satish Chandra Misra were seen laughing during the conversation over Modi's Fitness Video. How Congress Stunned BJP In Jayanagar?